Have you ever had one of those day when you would quite like the world to stop so that you can get off, please? Well that is how I have felt today! One of my whippets, Hector, has been violently sick all night long. Hector has an auto-immune disease called glomerulo nephritis. It is a chronic condition which varies from day-to-day. He has good days and bad days but generally he is a happy chappy. I was about to say happy little chappy but in fairness, Hector is a bit of a chunky whippet due to the steroids and other meds that he has to take to keep his condition under control. I know that Hector is not going to be with me for a long but as long as he is pain-free, happy and has a good quality of life then I’m happy. So having been up with him all night and seeing that he still wasn’t right this morning and still had a raging temperature, you can imagine my dismay when my marvelous vet, Rachel, said she wanted to keep him in,do some bloods and get him on a drip. Needless to say I was imagining the worst. Not helped by my Mother telling me that it is cruel to let him suffer! Yes, I know Mum! Why do you think I’m in such a state? I truly believe in quality of life rather than quantity so I really was prepared for the worse. Imagine my delight when I got the call to say that I could go and pick him up! Hector is presenting as having a mild case of pancreatitis probably caused by eating pigs ears as a treat. Apparently the fatty treat puts too much strain on the pancreas if your dog already has a chronic underlying ailment. So no more pigs ears for Hector and lots more medication instead! 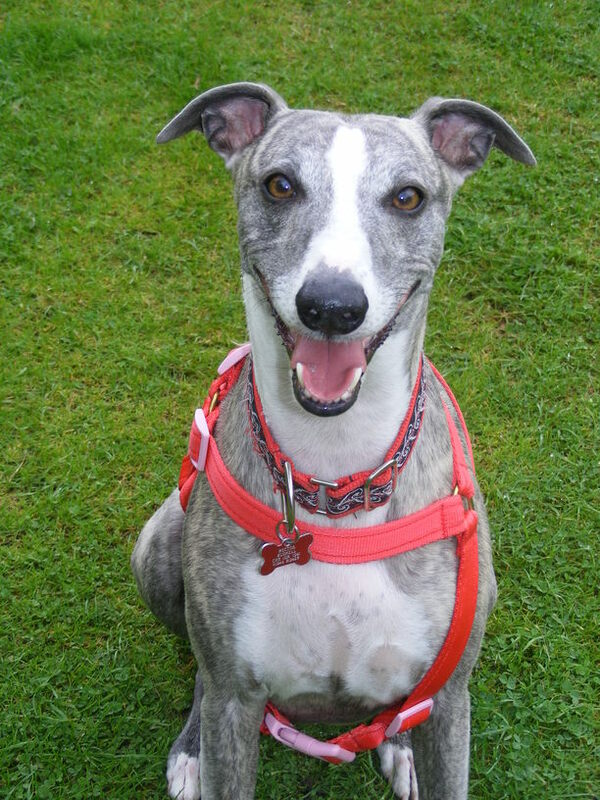 I wish you could have seen the big goofy smile and the waggy tail when Hector was brought into the consulting room and that was just from me! I know that when the time comes I will make the right decision to let Hector go painlessly and with dignity but not just yet! Thank goodness! In the meanwhile I will make the most of my oversized whippet and while away the hours baking. 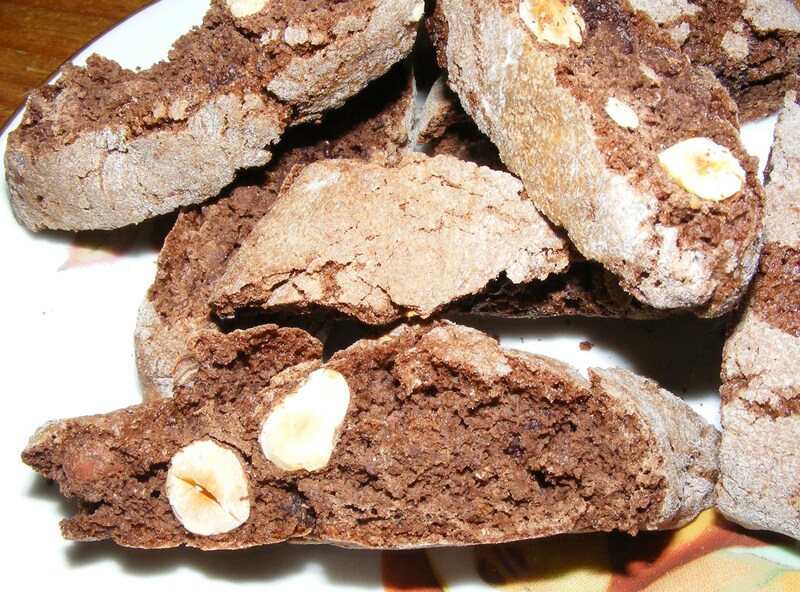 Here, as promised in my Christmas morning biscotti post, is my version of chocolate and hazelnut biscotti. They taste just like nutella! Place the flour, cocoa, sugar and baking powder in a mixing bowl then a stir in the eggs until a soft dough forms. Turn the dough onto a lightly floured board and split the dough into 4 equal pieces. Lightly flour your hands then roll each piece of dough into a sausage shape approximately 12 inch long. Place the dough onto the prepared trays, making sure they are well spaced. Bake for 15-25 mins until the dough is well risen, firm to the touch but not too brown. Allow to cool for a few minutes on a cooling rack. Cut the dough diagonally, using a bread knife, into 1cm thick slices. Place the slices back onto the baking sheets, cut side down, and bake for 10-15 minutes. Turn the slices over and bake for a further 10-15 minutes.